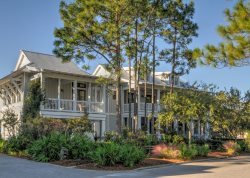 Rosemary Beach is a traditional style, yet young development, established by Guy Chesterfield Sr. in 1995. Set along 105 acres on the beautiful stretch of Highway 30A, the decor and environment was created to remind visitors of a West Indies beachside resort. With carefully crafted cobblestone streets and evenings lit by gas lanterns, Rosemary Beach is also reminiscent of small town old Europe. Rosemary Beach boasts stunning views of the Gulf Coast and was fortunate enough to be one of few coastal cities not affected by the Gulf oil spill in 2010. Needless to say, tourism to Rosemary Beach, FL has only increased over the years as many vacationers come to enjoy the quietness of the town, white sandy beaches, and bocce ball tournaments or make a stop at the popular candy store, The Sugar Shak. Here at 30A Escapes, we have several well appointed Rosemary Beach rentals for any size of family. Whether you are looking for a loft style for a last minute getaway, a larger vacation home with a private pool and amazing gulf views or a quaint cottage rental... 30A Escapes has the ideal Rosemary Beach vacation rental for you! We look forward to being your Rosemary Beach Vacation Concierge!